Address risk factors for healthcare-acquired pneumonias (HAPs), including ventilator-associated pneumonia (VAP), with Toothette® Oral Care - the #1 brand of comprehensive oral care1 and the only brand with proven clinical outcomes. Our latest offering, new Continue Care™ oral cleansing and suction systems has been developed to address pneumonia risk for the non-ventilated patient. Dysphagia, or difficulty swallowing, is often a consequence of stroke. About 500,000 patients per year in the US are affected by dysphagia due to stroke2. Q•Care's comprehensive approach to oral care focuses on cleaning, debriding, suctioning and moisturizing the entire oral cavity. 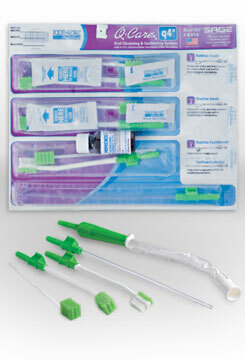 In fact, professional organizations are now recognizing comprehensive oral care as key to addressing VAP and HAP. Q•Care® Oral Cleansing and Suctioning Systems make it easy for you to provide comprehensive 24-hour oral care, while facilitating compliance to your oral care protocol.